The Mass which opens the program and the hymn that concludes it belong to Eastertide, as does everything on the program, but they are related only by using the same chant melody in the hymn verses and as cantus firmus in the Mass. The hymn is an alternatim setting with chant used for the three even-numbered verses, while the four polyphonic verses are all different, set for four voices until the final verse, the longest and most exuberant (Rice’s word) setting for five voices. The Mass is set for five voices with the Agnus Dei expanded (not unusually) to six voices. Rice suggests that the archaic mensuration devices used in the Mass indicate a young composer demonstrating his mastery, for these five Masses published in 1554 must have been composed while Palestrina was in his 20s. Mastery, indeed, is demonstrated throughout the Mass, which displays all the compositional skill of his mature Masses. 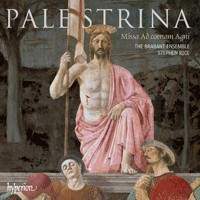 By my count there are still 35 unrecorded Palestrina Masses (give or take a few), but two of the rest exist only on mono LP, among 30 that cannot be recommended because of limited quality or availability. Stephen Rice’s effort can be counted among the 40 favored Masses. Not so many years ago we did not have the complete Bach cantatas or Haydn symphonies, but those have been recorded not just complete but in integral sets. That goal is not even in sight for this comparable body of works.